You know those times that you want something delicious, home made and chocolatey, but you don’t want to sweat for hours in the kitchen? In our house that’s almost every day. We love great food, but I honestly don’t love spending hours in the kitchen. That’s why I’m in love with anything that can be made in a single bowl! There’s so much less cleaning and fuss! 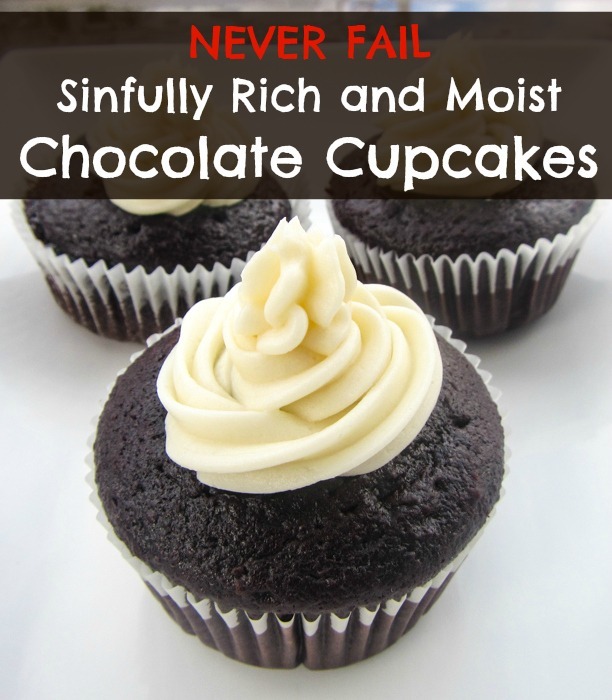 This is the perfect no fail chocolate cupcake recipe. We make it in our house every time (yes EVERY time) we’re craving chocolate cupcakes. Once in a while I try another recipe, and always kick my self because it’s never as good, or as easy, as this one. These cupcakes have it all. They’re rich, moist and chocolatey, easy to whip up in a single bowl, and best of all – they’re almost impossible to screw up. Here’s what you’ll need. The ingredients are pretty simple, and you should have most, if not all of these in your pantry already. 1 3/4 cups all-purpose flour. Note, you cannot substitute cake flour – use all-purpose flour. Cake flour will make these cupcakes rise too much. 5/8 cup unsweetened cocoa powder. We LOVE Hersey’s cocoa powder (click here to buy now on Amazon) for the richest, chocolatiest flavor. OK, chocolatiest isn’t a word, but you know what I mean – that rich, creamy, delicious chocolate taste! Flour and grease 24 cupcake tins or just use cupcake liners. Click here to see prices. Using a mixer, stir together the sugar, flour, cocoa, baking soda, baking power and and salt. Add the eggs, milk, oil and vanilla into the same bowl. Bake 30 to 35 minutes, until a toothpick comes out clean, or the top of the cake springs back if you touch it gently with your finger. IMPORTANT: This batter is very, very thin. It’s almost the consistency of a can of paint. Don’t let this worry you – the cupcakes will still turn out great! 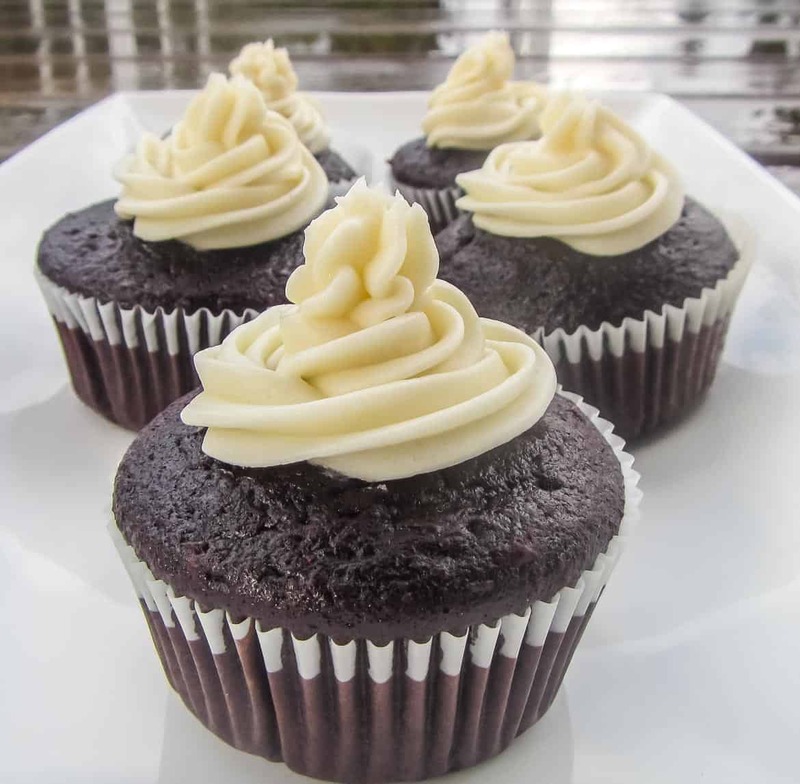 The picture below shows the consistency of these cupcakes – it’s very thin! In fact, it often comes out thinner than the photo shows. We like to use paper liners, and spray them with PAM or another vegetable oil before cooking. 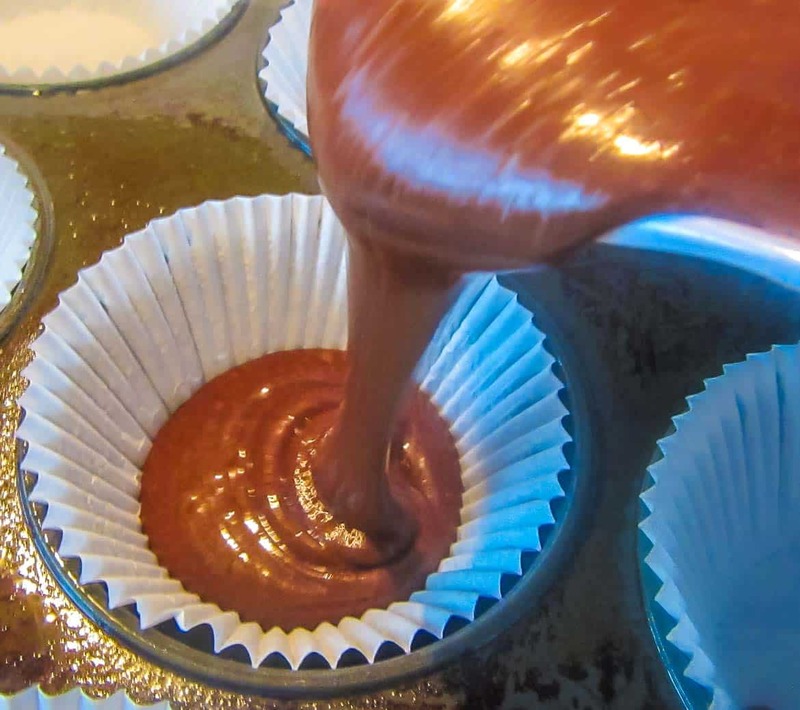 Spraying the liners helps the cupcakes come neatly out of the liners – they’re less likely to stick. This is an easy recipe to change. 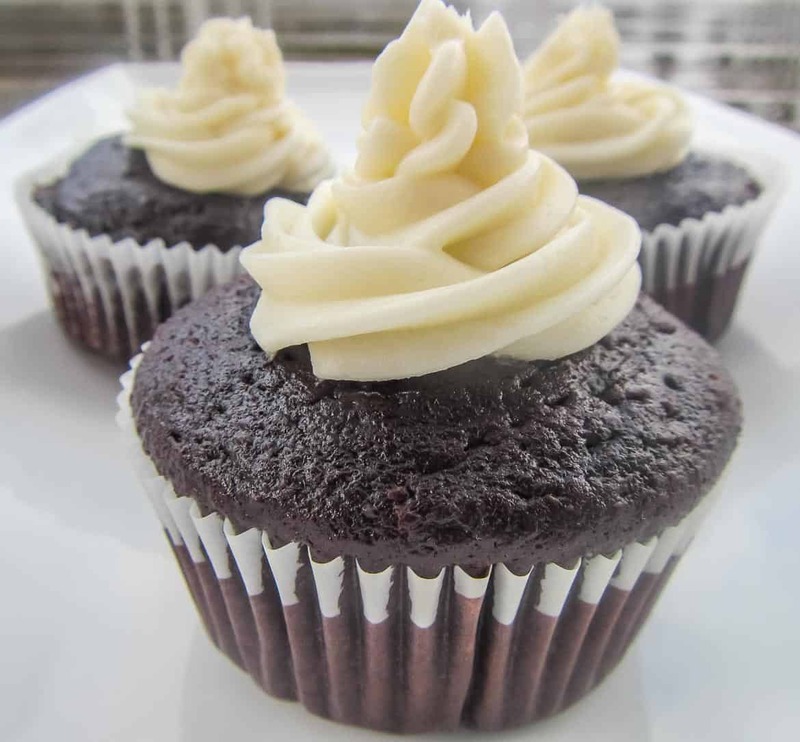 Just add a few drops of mint flavoring to make mint cupcakes, or a couple of tablespoons of espresso to make mocha cupcakes. You can even add half a cup of mini chocolate chips to make an extra tasty chocolate chip cupcake! Want to make better cupcakes? 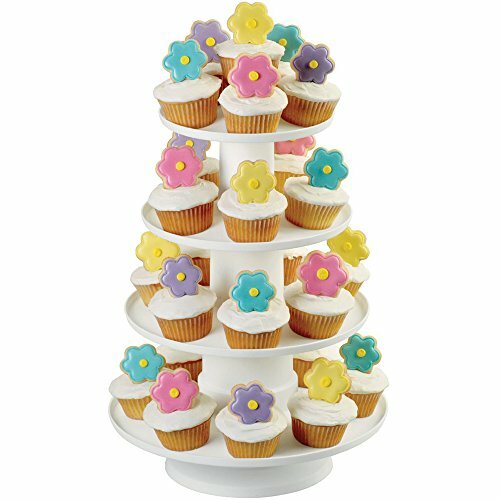 We love this Wilton 4-Tier Stacked Cupcake and Dessert Tower. 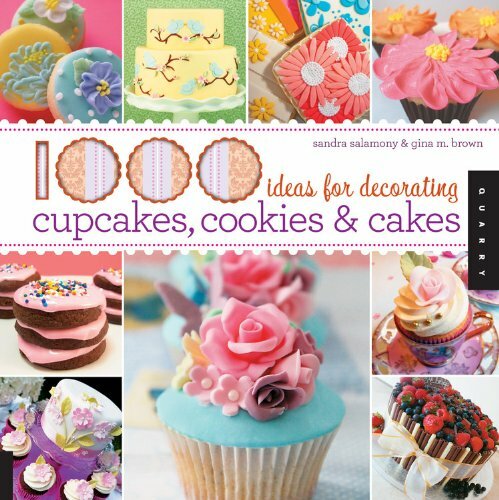 It’s the perfect way to show off your cupcake creations. See prices on Amazon here. 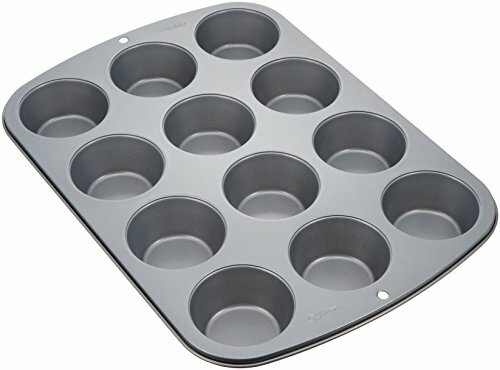 This Wilton regular cupcake pan is the perfect size, cooks evenly, and cleans up easily. See it on Amazon here. Did you make this cupcake recipe? Yes, I do this recipe and it is my favorite, everyone loves it. Been a while since I baked might do it as I have some homemade frosting;)! These look so good I want to whip up a batch now! Very tasty looking! These are excellent. Did think I messed up because the batter is very thin and this recipe made 24 standard sized cupcakes despite the recipe stating 12 (?). But they were perfect and EASY!! Thanks so much for catching that typo! I’ve changed the recipe to say that it makes 24 cupcakes. I made these with a group of seniors at a day program today. We followed the recipe and everything looked great. After 15 minutes in the oven the cupcakes rose and then fell flat in the tins. Was very disappointing after spending all that time in the kitchen. Is there a typo in the recipe anywhere? We were able to salvage the flat cupcakes by scraping them into bowls and eating it with ice cream. Still tasted good. Hi Hilda, we’ve made this exact recipe a dozen times and have never had that happen. We use an all purpose flour so make sure you’re using the proper flour as that can sometimes lead to problems. What does 5/8 cup translate to?! Hi Sharon, 5/8 cup is about 150 ml or 5 ounces. I do this recipe and substitute half a cup f water for bourbon ……. then top with a cinnamon buttercream. AMAZING!!!!! hello, what type of white sugar is used in the recipe? is it granulated, castor, or powdered? Hi Marie. We use granulated sugar in the recipe. We jusy tried this recipe and they boiled over and burned, instead of rising and cooking. What could we have done wrong? We are at a high altitude. Hi Lisa. It’s possible they were overfilled or you added too much of one ingredient. Is it possible the oven was set too high? Altitude does make a difference. Cupcakes are in the oven now. They have risen tremendously! Looks like i should have filled the batter 1/4 the way full instead of 3/4. And yes, I used all purpose flour. Hoping they turn out good becuase i chose this recipe for my sons birthday party cupcakes tomorrow! I hope i dont have to stay up making another batch this evening. Will update! My cupcakes were beautiful , but they only took 18 minutes to bake. Maybe it’s because I have a gas preffessional oven ? I live at sea level so things usually take the maximum time to bake. The toothpick came out clean so I pulled them out. Great easy recipe though! I made these muffins with hopes of having them for St Patrick’s Day. Good thing it was just for my family, because my muffins fell too like Hilda reported. I live at 3200ft above sea level, would that make a difference? Whenever I bake a basic cake it collapses too, however bundt cakes do fine. Altitude can definitely play havoc while baking Tamara and so can humidity. Also make sure you’re using the right kind of flour. Over beating can also result in a dropped cake so make sure you don’t overmix it. Under cooking or opening the oven too many times, especially at the beginning, can also account for dropping. If you have problems baking any cake, you can pick up a cheap thermometer like this to make sure you’re oven is reaching (and staying) at the right temperature. Also be careful not to overfill your tins otherwise the center might not be cooked enough when you go to pull it out. Hope one of these ideas help! So the recipe doesn’t say to line with cupcake liners…but the picture shows them so I used them. I couldn’t get them off the liners. The liners just torn apart (and I sprayed them before hand.) Mine also fell flat as someone else stated. Very disappointed and I have to start all over. Sorry to hear you had such problems Aarica. Sometimes I spray the liners really lightly and sometimes I don’t bother but have no problem either way getting them off once they’ve cooled down a bit. We’ve made them a dozen times and have never had one fall flat on us before either. Of course, in the US you shouldn’t use cake flour, or they could rise to fast and fall flat. Of course, and baking can vary depending on altitude and humidity. These are amazing Thank you. Do you think you could bake as a cake in a 9×13 maybe?? Sure Colleen, the first time we ever made this was as a cake for a birthday party. You’ll need to bake it longer but just check it with a toothpick before taking it out. Hi Annette! All purpose flour is plain flour. It’s funny – we’re from Canada, and almost all recipes (both bread and cake) are made with all purpose (plain) flour, so I honestly didn’t think to put plain flour in the directions. Thanks for asking! So are you saying in the U.S. You need to use cake flour?? No. In the USA, use all purpose flour. Hey I’m wanting to make this recipe for my family but all we have is unsweeted special dark chocolate cocoa powder. I was wondering if I make it will that will it still turn out the same or will it me up the cupcakes? I’m sorry for bothering you this is my first time making cupcakes from scratch and im trying to make sure I do it right. Thank you! Yes, it should work just fine. They’ll have a dark chocolate taste from the cocoa powder, but they sound delicious! Make sure you use regular all purpose flour and NOT cake flour! I’m not sure if this happened with anyone else but the cupcakes I made got stuck to the liners. Otherwise they were great! These are the best cupcakes I have ever made and had! I made them for treat week at work and they were a hit. I was a little sceptical about the “as thin as paint” batter but when they were ready to eat they were moist and delicious. Hi sorry to bother you but is it okay for me to use self rising flour instead of all purpose flour. Also thank you for the recipe I made it many times before for my family by using all purpose flour and they loved it. They were delicious, moist and beautiful!? Hi Krista, You need to use all purpose flour. 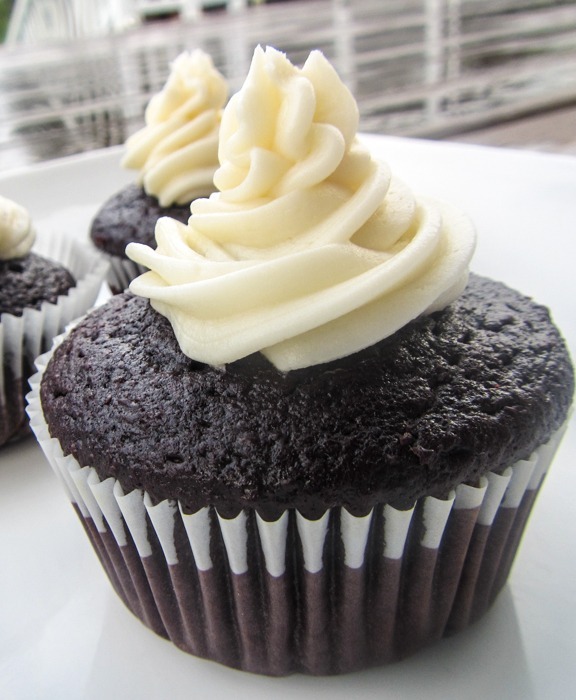 If you use self rising flour, the cupcakes will likely rise to far and overflow the tins. Mine also fell a bit after rising, but are still delicious and moist. One note, ive made these 4 times and i always bake for 17 minutes. Not sure how they would be after 35.